Champion air-cooled reciprocating pumps and air compressor packages can be used to match the needs of a wide variety of compressor applications. 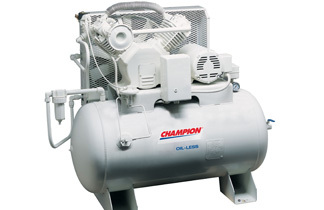 Champion has air compressors designed for home use to air compressors that are used for plant air service. Champion reciprocating air compressors are well suited for many applications. CompAir offers the latest in oil free technology with its D and DH Series product lines. Offering the fixed and variable speed oil free two stage dry screw D Series and the oil-less single stage water injected variable speed DH Series, CompAir’s equipped to meet a variety of application requirements. Incorporating efficient TEFC motors, low sound enclosures, superior performance and small footprints, CompAir’s oil free product lines are worth taking a look at.